I have some bear blocks my sister gave me. I machine quilted separately and intended to join them in a quilt-as-you-go manner. I've done it before, but do not find it fun. Could I join them on the front and then add a second full piece backing? Sure. Lots of quilts are pieced on muslin as a foundation, batting & backing added. Don't see why your quilt would be any thicker, except at the joins. maybe you can trim the batting away at the seams. are you going to sew skinny sashings to join them together? that way the batting edges together. no thickness to worry about in seams. Yes, you certainly can add an extra layer of backing. If you are doing sashing, you can add a fusible batting in the strips before piecing the blocks. Cut the batting 1/2 inch less than sashing width and it won't add bulk in the seams. You could add just a backing and perhaps just tie it at the intersections on the front. That way the front would be the same as now. Hope this helps. 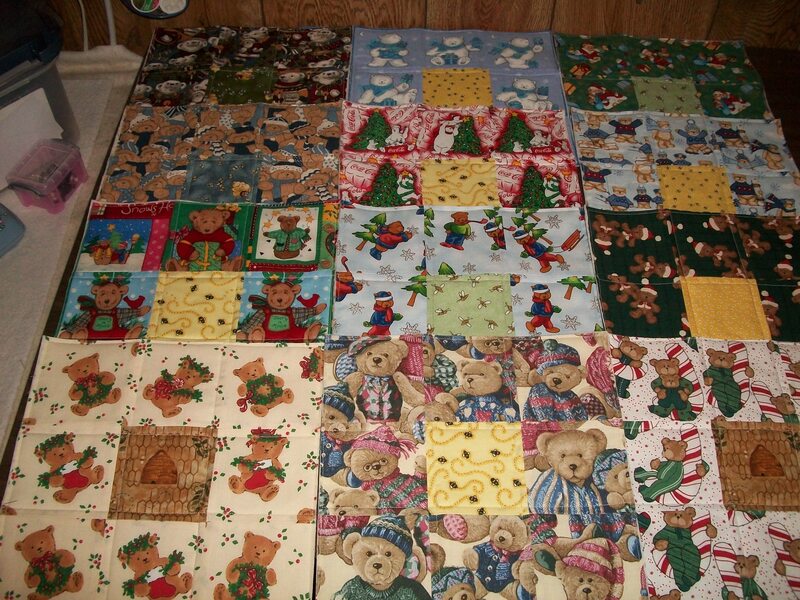 I have most of those teddy bear Christmas fabrics. Cute. I don't see why not. You will never know, unless you try.